When we think of a power hitter in the Indian lower middle-order, there is only one name that comes to our minds - MS Dhoni. In his early days of career, MS Dhoni was known for his power-hitting ability and especially the Helicopter shot, but since the previous World Cup, there have only been a few instances of him trying the Helicopter shot. Hardik Pandya is the new name in the power-hitting department but except for two or three outings, he has also not lived up to the expectations. So again the responsibility falls on Dhoni's shoulder, but if we look at his strike rate in the past few years it has been constantly dipping which is a trouble for the Blue squad. Having a genuine consistent all-rounder on your side is a plus point in the present era of cricket. Consistency for an all-rounder doesn't mean to perform constantly with both bat and ball but to perform in at least one field on any given day – as that too is a valuable asset. 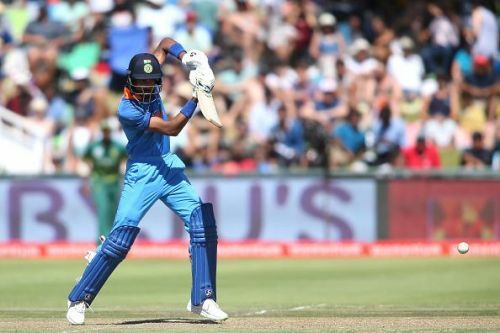 With Hardik Pandya, it seemed like India's hunt for the all-rounder is over but his inconsistent performance with bat and ball has increased the confusion and tension for the captain and coach as well as for selectors. Recently, he even suffered a back injury which made the way for Jadeja to come back in the ODI team after a wait of more than a year. Jadeja utilised the opportunity and proved his capability by his performance but the question is -- can he maintain it till the World Cup? We will get the answer very soon as India will be playing 5 ODIs against the West Indies starting from 21 October. Last year India participated in the Champions Trophy and throughout the tournament, they were performing significantly but in the final against Pakistan, they failed to handle the pressure and their batting line-up collapsed miserably in front of the ferocious Pakistani bowling attack. The same happened in the Nidahas Trophy where India struggled until the last ball to win the final against Bangladesh. The most recent was the 2018 Asia Cup Final in which India was facing a much lower ranked Bangladesh. As happened in the CT and Nidahas Trophy, Indian top-order departed early while the middle-order failed to handle the pressure. It was Bhuvneshwar and Jadeja who rescued India and won the match on last delivery. This shows how India's performance changes with the change in the level of match. The biggest tournament is yet to come for which India needs to work on all these issues if they want to win it.